Xbox One version reviewed. Review code provided by the developer. 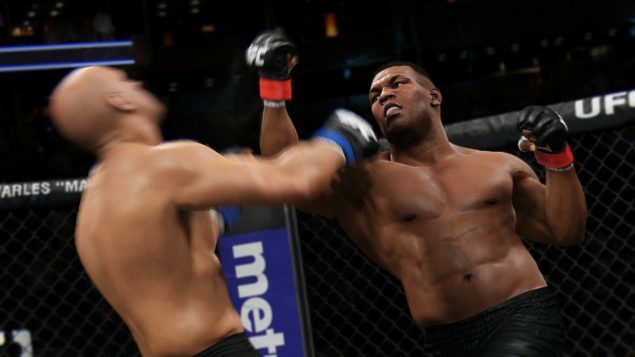 For some of us, EA Sports’ UFC 2 is a perfect simulation of our physical skills. I spent half my time trying to pull of awesome moves and missing my opponent by about a mile, and the other half crying on the floor while someone kicked me in the head. Finally – a realistic fighting game. 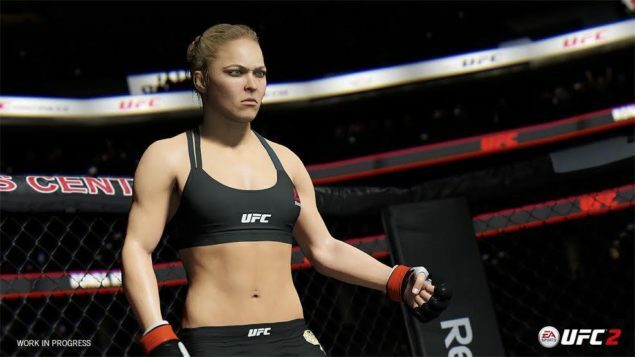 From the very get go, it’s clear that EA are pushing this as the game for UFC fans. It’s all about the atmosphere, the cheers of the crowd, the excitement of the commentary. The developers got it just right in that even the longest, most mistake-ridden bout still feels like an event. This is a massive contrast to a lot of other sports games, where player action can easily make Chelsea look like the Elephant and Castle Old Boys. Little things like having the option to bump gloves go a long way towards making this more than just slapping around another person. Small touches make it feel like this is a game based on real life, not just the rigid rules of a sport. But ultimately, it’s how well it feels and how well it emulates the action of the real life game that any title should be judged on. The controls are easier than ever to pick up, and while they’re still a little bit contrived, that’s more a result of having to use a controller at all than a specific fault on the part of the developers. Having to combine buttons to do specific actions without thinking isn’t as easy to rote learn as, say, the special moves in Street Fighter. Although the latter is more complicated, there’s less room for mistakes. But picking up the basics is fairly easy and all but the most elite of players will be happy without too much practice. Grappling is controlled almost entirely with the right analogue stick, which takes you out of the action a little bit but definitely reduces how complicated it was in the previous title. Perhaps it reduces it a little too much. You pick moves and, so long as you can hold it without being interrupted, that move is successful. You also have to try and counter your opponents moves. It’s simple, but does what it needs to do, usually. The ground game never really gets to the point where it should be your top option. I think that’s my only major problem with the gameplay. It feels easier to smack someone in the face that it does to get into mildly compromising positions with someone on the floor and, as with all things in life, why bother taking a hard route when an easier one will do the job? My joke about missing your opponent is mostly true. It’s easy to spend a lot of time narrowly missing the other player, if only because sometimes you can’t quite judge the effect a move will have. Thankfully, this is all on the player and it never feels like a problem. There are times, on the other hand, where attacks almost don’t seem to register. A punch to the mouth seems to just slide off, with barely any noise and zero reaction from the person you’re hitting. It could be a comparison thing – a glancing blow compared to a proper smack – but it stands out and feels off somehow. But despite that major problem, the gameplay is great. It’s very enjoyable with few, if any, genuine problems. Thankfully, you’re not just limited to reliving fights of the biggest names. There is an absolutely massive catalogue of fighters and modes to work your way through. This is a huge improvement over the last entry. If you fancy a quick fight, that option is of course in full force, but mini-games and longer career modes are available as well. If you want this to be your main title for the next few months, there’s enough content here to make sure you aren’t repeating the same things over and over. Granted, the gameplay itself obviously stays exactly the same pretty much regardless, but the whole career progression, taking your character from training to world champion, is much appreciated. One of the biggest marketing points of this and many of EA’s other sports titles is the visuals, and they don’t disappoint. In fact, they’re almost too good in many ways. People look great, especially those in the ring. The detail is way better than you’d ever expect from a sports title which, to be fair, they could have just churned out. Hair moves realistically and bruises and breaks are enough to make a haemophobic queasy. That’s beyond the obvious: the fighters just look great. It’s when you get clips of score girls between rounds that things become a little uneasy. Again, they’re structured well and move as you’d expect, but there’s something about their eyes and expression that just doesn’t seem right. It’s an unexpected visit to the uncanny valley. Without a simple solution, it’s hard to knock EA too much for this occasional problem. A special mention must also be made of the sound design. It’s beautiful, both in terms of the way it’s mixed and the sound effects used. We’ve already mentioned the commentary, and to be fair you’d expect that to be at least pretty good, but it really does make the atmosphere. Beyond that, when you actually connect a punch or a kick, you can really feel it and most of that is down to the audio. When you properly boot someone in the face, the corresponding click, as well as the cheer from the crowd, makes you cringe. It cannot be knocked. 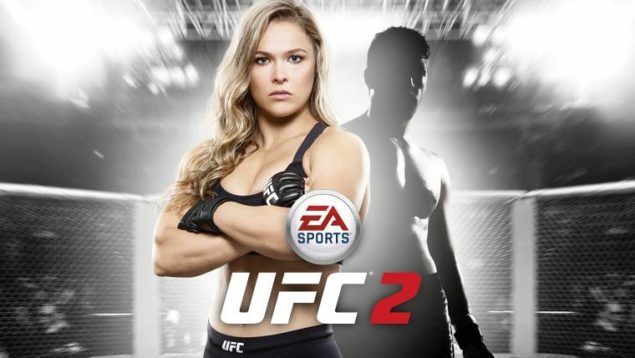 It’s clear that EA have taken a lot of the complaints about their first UFC title on board when creating their second. They’ve added a bunch of content and fixed the grappling system in many ways. It’s still by no means a perfect experience, but the problems are far from game breaking. This is what a sports title should be and while it probably won’t bring in any new fans to UFC, it’s a more than decent representation for those that already love it.